This is my husband’s favourite snack. For years now, he has been telling me that I should market this hummus. He never gets tired of it and always complains that the store-bought ones aren’t as good as mine. The original recipe came from a Bon Appétit magazine, but I have tweaked and re-tweaked it. So here is my recipe. I always play with flavours as I cook. If your palate is more on the intense side, kick it up with extra garlic and ginger. If you want a subtle, but lovely change, use cashew butter instead of the tahini. Serve it with fresh veggies, pita bread, crackers or your favourite corn or pita chips. Mince the garlic and ginger in a food processor. Add the rest of the ingredients, except for the cilantro and onion. Process until the consistency is smooth and creamy. Add the cilantro and green onion and pulse until there are green flecks through the hummus. Looks awesome and can’t wait to try it. 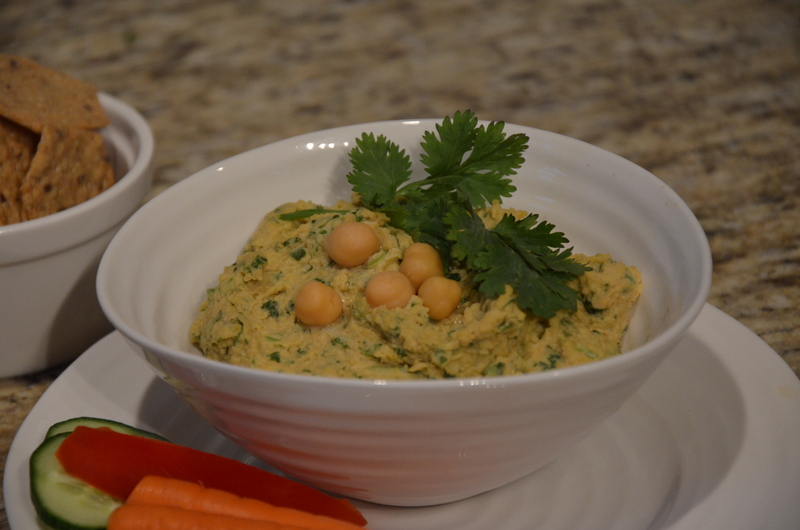 Hummus is one of my favourite appetizers, so yours may become one of my repertoire. I’ve made this hummus recipe and it is awesome! It is better than anything out there on the market! Thanks RC! Like I said, this is really the only recipe for hummus that I ever make anymore! My family likes the unusual combination of flavours! Yum! Hummus is great, and this is an excellent twist on that classic! Thanks so much! Yes, this is a really different twist on hummus, but it really works! Thanks for stopping by! I love the addition of cumin and the chilli garlic sauce. A great twist to hummus! Hey Liz, thanks for checking out this older recipe! It is our favourite hummus recipe for sure! Have a great week!